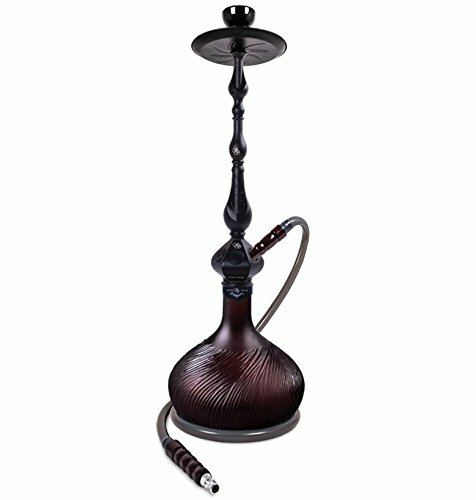 Sahara Smoke 32'' Jinn Inferno Hookah PURPLE by Sahara Smoke at Serious Jones. MPN: R41. Hurry! Limited time offer. Offer valid only while supplies last. Vase is Deep Purple, not deep red. Engineered for Maximum Performance. Sahara Smoke Hookahs are the highest quality hookahs in the market since 2002. Vase is Deep Purple, not deep red. Engineered for Maximum Performance. Sahara Smoke Hookahs are the highest quality hookahs in the market since 2002. Hand Blown Thick Glass by highly qualified glass blowing Artist. The metal stem includes all stainless steel tubing to prevent rust. Includes the #1 selling hookah bowl in the world! The Vortex. The hookah is easy to assemble, disassemble, and clean. Large charcoal tray to catch ash, and stainless steel tongs to carry hookah coals. ALL Sahara Smoke hookahs are assembled and inspected in the USA before shipping. Hookah will be shipped in a thick cardboard box with pillow packaging to protect your hookah during transit. Your Hookah will ship directly from the Sahara Smoke Warehouse. Orders placed Friday afternoon through Sunday will ship Monday. Total Height (from glass base to top of bowl): 32"
KHALIL MAMOON ASHRAF STAR 34” COMPLETE HOOKAH SET: Single Hose shisha pipe. Handmade Egyptian Narguile Pipes. These are Traditional Heavy Metal Hookahs.